Lancaster Electric Company, LLC is a family owned and operated company that has been providing quality commercial and industrial electrical service for the Carolinas since 1985. We are fully licensed, insured, and bonded. In addition, we are proud members of the Avetta program and SHARP Construction program. Specializing in providing our clients with the highest quality commercial and industrial electrical installation and services. Our team of highly trained electricians are committed to maintaining the highest level of professionalism and dedication and safety to our customers. 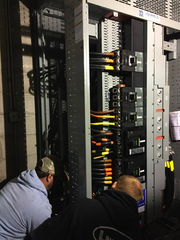 We provide complete commercial and industrial electrical services for new construction, building modifications, maintenance, and any of your special electrical needs. Rate and review Lancaster Electric Company, LLC in Wilmington, NC, United States! Share your experiences at Lancaster Electric Company, LLC with your friends or discover more Electricians in Wilmington, NC, United States.